We can help you get rid of your glasses! Laser Assisted Cataract Surgery, the SAFE, EFFECTIVE, GENTLE, COMFORTABLE and PRECISE way to do the Cataract surgery today. No Drops After Cataract Surgery, is that possible? Dr. Youssef, dedicated to Most Advanced, Proven Technology with the Best Outcomes in the Field. At PVSC, we have a state-of the art dedicated ASC (Ambulatory Surgical Facility) on the premises. Having the ASC onsite offers Convenience, Safety, Controlling costs, Better patient experience. Tired of reading glasses? We have options! We can treat Astigmatism! LEARN MORE. Told not a candidate for LASIK? We have the most advanced and proven solutions. Learn more! We are an accredited centre for managing dry eyes with excellent outcomes. Are you not suitable for LASIK?!! We have excellent treatment Options for higher prescriptions. Assigned status Up to Date by Sadiqa K Stelzner, MD, FACS on November 21, 2014. Endoscopic cyclophotocoagulation (ECP) is a cyclodestructive procedure developed by Martin Uram in 1992. It functions to minimize the disadvantages of more traditional cyclodestructive procedures while maximizing the advantage of ablating the ciliary body epithelium to decrease intraocular pressure (IOP). It uses a laser endoscope containing three fiber groupings: an image guide, a light source, and the semiconductor diode laser. This technology allows direct visualization of the ciliary epithelium. Allowing the laser energy to be precisely delivered to the ciliary processes, thus limiting damage to the underlying ciliary body and surrounding tissue. Cyclodestruction as a method to treat glaucoma was first observed by Heine when he discovered that detachments of the ciliary body resulted in decreases in intraocular pressure. In the 1960’s, Purnell advocated a trans-scleral ultrasound radiation to produce the desired destruction. Since that time, cyclophotocoagulation through either a trans-pupillary route or a contact or non-contact trans-scleral route has been popularized utilizing a multitude of different lasers.Various attempts at decreasing intraocular pressure via cyclodestruction share a common set of disadvantages and complications. Prior to ECP, cyclodestructive procedures involved the surgeon attempting to ablate the ciliary tissue with limited ability to assess anatomic accuracy or qualitative effect. Complications include prolonged hypotony, pain, uveitis, hemorrhage, choroidal effusion, anterior segment ischemia, scleromalacia, failure and need to retreat, and postoperative visual loss associated with chronic cystoid macular edema. Traditionally, these procedures had been limited to patients with refractory glaucoma’s, usually as a last resort after failure of other surgical procedures. ECP affords the ability to apply cyclodestruction in a more targeted fashion directly to the target tissue, ciliary epithelium, while minimizing collateral damage. Histologic studies confirm that there is less tissue disruption with ECP than with transcleral cyclophotocoagulation (TSCPC). Lin and colleagues  showed that TSCPC caused severe disruption of the ciliary process and the iris root and caused an occlusive vasculopathy out to 1 month. By contrast, ECP caused localized shrinkage of the ciliary process only. ECP also caused occlusive vasculopathy but there was partial reperfusion by 1 month. They speculated that the partial return of blood flow may partially account for the lack of hypotony and phthisis with ECP as opposed to TSCPCP. Patel and colleagues were the first to report endolaser treatment of the ciliary body for uncontrolled glaucoma. 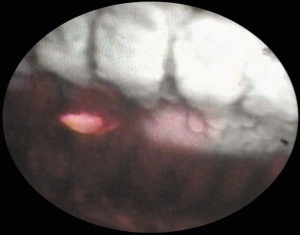 This technique was done using scleral depression through an operating microscope and not with an endoscope. Uram developed an intraocular laser endoscope with both vitreoretinal and anterior segment applications. This was first reported in 1992 while using the endolaser to treat neovascular glaucoma. The Uram unit has two basic sets of instrumentation: the laser endoscope and the equipment console. 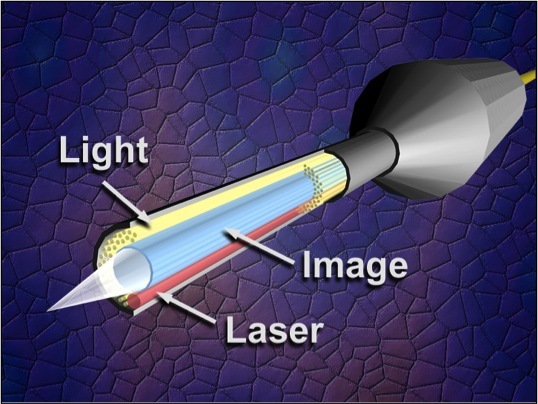 The laser endoscope has three fiber groupings: the image guide, the light guide, and the semiconductor diode laser guide, which is set to the 810-nm wavelength. These three exist as either an 18- or 20-gauge endoprobe with a 110° field of view and depth of focus from 1 to 30 mm. The light guide employs a 175 W xenon light source. With endoscopic cyclophotocoagulation, ciliary processes may be accessed from either a limbal or a pars plana approach. Assessment of lens and vitreous status is important in determining an ECP surgical plan. Ciliary processes may be accessed from an anterior approach in phakic, pseudophakic, and aphakic eyes. The limbal approach is generally recommended in patients undergoing ECP combined with cataract surgery and intraocular lens implantation (see corresponding figure to the right). The incision should be at least 1.5–2.2 mm in length. Both clear corneal and the scleral tunnel incisions commonly used in cataract surgery provide adequate access for the endoscope. A pars plana approach can be considered in pseudophakic patients and provides the most complete view of the ciliary processes (see corresponding figure to the right). However, an anterior vitrectomy must be performed if this approach is used. Topical, peribulbar and retrobulbar block techniques all provide acceptable anesthesia. To perform ECP, the anterior chamber must be stabilized and the ciliary sulcus must be deepened with an ophthalmic viscoelastic device (OVD). Healon GV may be the most advantageous OVD to use in this setting. Other cohesive OVD such as Healon and Provisc may not be able to maintain the space in the ciliary sulcus well enough for ECP. Healon 5 would maintain space well but may increase the risk and severity of early postoperative IOP spikes. Dispersive OVD such as Viscoat and Amvisc do not maintain space well and also have a tendency to absorb laser energy. 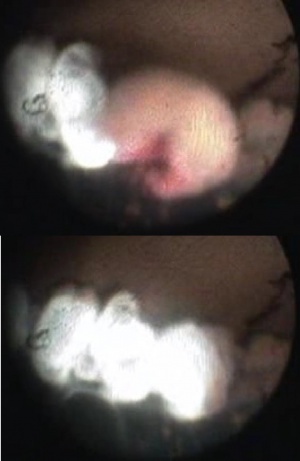 One of the great advantages of ECP over transscleral cyclophotocoagulation techniques is the ability to deliver laser energy in a highly titratable fashion to the ciliary processes. The optimum tissue effect is to whiten the ciliary process and effect visible tissue shrinkage. Photocoagulation is applied with the endoscope 1.0–3.0 mm from the ciliary processes. Kahook and Noecker and colleagues recommend lasering with a distance of about 2 mm from the ciliary processes. From this distance one can usually see 6 ciliary processes in the field of view of the endoscope (see corresponding figure to right). This distance is ideal for minimizing laser energy transmission loss while also minimizing the risk of overtreatment. The power levels of the 810-nm semiconductor diode laser are titrated upward from lower power levels to achieve whitening and shrinkage of the ciliary processes (see corresponding figure to right). Usually 100-300 mW is all that is required to achieve the desired effect on tissues. 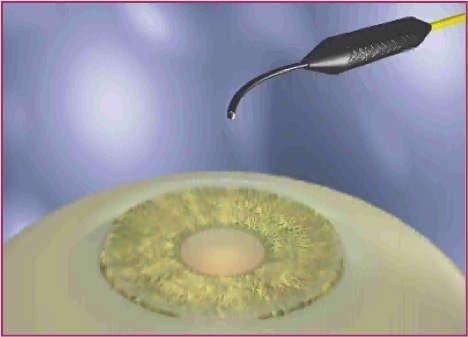 A slow continuous wave application of the laser treatment allows surgeons to methodically “paint” the entirety of each ciliary process in a smooth, well-controlled fashion. Treatment of at least 270° is often required to get optimal intraocular pressure reduction with ECP. If administering ECP through one incision, the curved endoscope probe enhances a surgeon’s ability to expand the ciliary process treatment area beyond what can be accomplished with a straight endoscope. Kahook and colleagues showed that 360 degrees of treatment with ECP through two incisions is superior to partial treatment through one incision. 360 degree treatment produced lower IOP, gave greater reduction in glaucoma medication burden, and had fewer treatment failures than partial treatment. For the most refractory cases, that have failed multiple glaucoma surgeries, ECP Plus can be performed. ECP Plus, is doing ECP but extending the treatment 1-2 mm onto pars plana (see corresponding figure to the right) for a more aggressive IOP lowering effect. This technique requires a pars plana approach and requires the patient to be pseudophakic or aphakic. A pars plana vitrectomy must also be performed. Many practitioners recommend aggressive corticosteroid use to quickly suppress the inflammation induced by ECP. Some advocate the administration of intravenous dexamethasone in the operating room in addition to intracameral preservative free dexamethasone and subconjunctival dexamethasone. The indications for performing ECP remain somewhat controversial and continue to be debated. In light of the complications potentially associated with this procedure, cautious patient selection for this procedure has been advised. ECP has been utilized in a wide variety of glaucoma types including primary open-angle, angle-closure, pigmentary, neovascular, traumatic, pediatric and other refractory glaucoma’s. 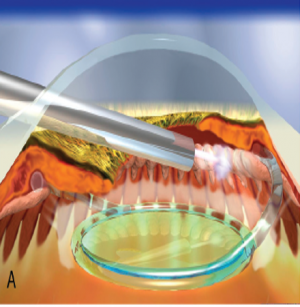 With the improvement of laser technologies, the use of scleral transillumination, endoscopic techniques, and the accuracy of treatment location have challenged preconceived notions as to where cyclophotocoagulation fits into the glaucoma treatment armamentarium. Evidence is growing that supports cyclophotocoagulation as a viable treatment in patients with mild to moderate and medically controlled glaucoma’s with good vision potential. At this time however, no long-term randomized prospective studies comparing ECP to trans-scleral cyclophotocoagulation and trabeculectomy exist. Most recently, ECP has been increasingly utilized in conjunction with cataract extraction as an initial glaucoma surgery. Early studies seem to support that ECP is effective in lowering IOP and suggest an excellent safety profile in this setting. With extensive ECP experience, Berke suggests performing ECP in combination with small-incision cataract surgery in patients with cataract and moderate glaucoma on two or more medications. Visually significant cataract is commonly the driving force in the decision to proceed with phaco-ECP in patients with both cataract and glaucoma. Despite extensive positive anecdotal experience, more prospective well-controlled long-term studies are necessary to more accurately determine the actual benefits and indications of ECP. Intraocular pressure spikes, increased postoperative inflammation, intraocular lens dislocation, and long-term efficacy remain legitimate concerns. The long-term efficacy and potential implications on concurrent ocular diseases remain largely unknown although a new study by Siegel et al. retrospectively looks at 72 month follow up time of combined phaco-ECP. The limited postoperative course following ECP is one of the most desirable features associated with the procedure. In most patients, postoperative management of both ECP alone and also combined ECP and cataract surgery is similar to that encountered with cataract surgery alone. The perioperative use of topical broad-spectrum antibiotic, topical prednisolone acetate 1% or topical difluprednate, and topical non-steroidal anti-inflammatory medication are generally recommended. In the immediate postoperative period, use of topical or systemic glaucoma medication may be helpful in preventing early postoperative intraocular pressure spikes. With early aggressive management of inflammation, complications such as posterior and anterior synechiae, posterior capsule opacification, and cystoid macular edema mirror those experienced in patients undergoing cataract surgery alone. Glaucoma medications are often slowly tapered down over the first one to two months. After combined phaco-ECP numerous patients with mild glaucoma who were previously controlled on one to two drops have been completely tapered off their prior regimen with good IOP control.IOP lowering from ECP is usually seen within the first postoperative month. However, there is one case report of IOP lowering that was not seen until 14 weeks after ECP was performed. The most common risks for glaucoma patients undergoing cataract surgery with or without ECP include vision loss, excessive pain, hemorrhage, infection, inflammation, retinal detachment, blindness, retained lens material, zonular dehiscence, need for additional surgeries including trabeculectomy, failure of the procedure, posterior capsule opacification, ptosis, diplopia, cystoid macular edema, and risks of anesthesia including death. The additional risks of glaucoma patients undergoing cataract surgery with the ECP procedure include hypotony, ciliary block glaucoma, and phthisis bulbi. One case of phthisis bulbi after ECP has been reported. Also, one case of malignant glaucoma after ECP has been reported. Sympathetic ophthalmia has been reported with transscleral cyclophotocoagulation, but per a current literature search has never been reported with ECP. The ECP Collaborative Study Group reported their findings in 2007, of 5824 eyes with a mean follow up of 5.2 years. They reported IOP spikes in 14.5% of patients from retained viscoelastic, cataract in 24.5%, hyphema in 3.8%, and choroidal detachment in 0.36%. Cystoid macula edema rates were extremely low at 0.7% and vision loss > 2 lines were only seen in 1.03% of patients. Other serious complications such as retinal detachment occurred in 0.2%, choroidal hemorrhage in 0.09%, hypotony in 0.12%, and NLP vision in 0.12%. All of these severe complications occurred in eyes with neovascular glaucoma. No patients with POAG or PXG, PKP glaucoma, or ECP combined with phaco developed these issues. Also, no chronic inflammation or endophthalmitis was reported. Berke and colleagues showed that in a randomized controlled trial in 626 medical controlled glaucoma patients, phacoemulsification combined with ECP was superior to phacoemulsification alone in IOP lowering and decreasing glaucoma medication burden. The phaco-ECP group went from a preop IOP of 19.08 +/- 4.14 on 1.53 +/- 0.89 medications to a postop IOP of 15.73 +/- 3.00 on 0.65 +/- 0.95 medications. The phaco alone group showed no sustained IOP lowering or decrease in medication burden going from a preop IOP of 18.16 +/- 3.38 on 1.20 +/- 0.83 medications to a postop IOP of 18.93 +/- 4.12 on 1.20 +/- 0.87 medications. They reported no serious complications in either group and the rates of cystoid macular edema were the same in both groups. Chen and colleagues showed that ECP can be effective in refractory glaucomas that had failed prior glaucoma filtration surgery and transcleral cyclophotocoagulation. They reported IOP reduction from a preop value of 27.7 +/- 10.3 to a postop IOP of 17.0 +/- 6.7 mm Hg at final visit (34% decrease). They reported 90% success defined as IOP <= 21 mm Hg. They also reported a reduction in glaucoma medications from 3.0 +/- 1.3 preop to 2.0 +/- 1.3 postop. Only 6% had a loss in visual acuity of 2 or more lines. Fibrin exudate was seen in 24%, hyphema in 12%, CME in 10%, and choroidal detachment in 4%. There were no serious complications such as hypotony or phthisis. ECP also compares favorably with other glaucoma surgeries. Lima and colleagues reported that in 68 pseudophakic eyes with a history of a failed trabeculectomy, prospectively, ECP had an equivalent success rate to Ahmed Glaucoma Valves with fewer complications. Gayton and colleagues in a randomized prospective trial of 58 patients between phaco with ECP versus phaco with trabeculectomy, reported that both groups had similar success rates. The phaco with trabeculectomy group did however, have a higher rate of success without additional glaucoma medications. Tan, Noecker, Francis, and colleagues reported good results with ECP plus in a retrospective analysis of 53 patients who had uncontrolled glaucoma despite prior glaucoma surgery on maximum medical therapy. They reported IOP lowering from 27.9 +/- 7.5 preop to 11.1 +/-6.5 at 2 years postop with a significant reduction in medication burden from 3.4 +/- 1.2 preop to 0.6 +/- 1.3 postop. Because of the aggressive nature of ECP plus, a relatively high rate of hypotony was reported, about 7.5%, which is very rare with standard ECP. One patient suffered a failed corneal graft postoperatively but there were no other serious complications. American Academy of Ophthalmology. Pediatric Ophthalmology/Strabismus: Cyclodestructive procedures – cyclocryotherapy, cycloablation with laser, transscleral laser cycloablation and endoscopic cyclophotocoagulation Practicing Ophthalmologists Learning System, 2017 – 2019 San Francisco: American Academy of Ophthalmology, 2017. Jump up ↑ Uram M. Endoscopic cyclophotocoagulation in glaucoma management. Curr Opin Ophthalmol. 1995;6(2):19–29. Jump up ↑ Heine L. Die Cyklodialyse, eine neue glaucomoperation. Deutsche Med Wochenschr. 1905;31:824–825. Jump up ↑ Purnell EW, Sokollu A, Torchia R, et al. Focal chorioretinitis pro- duced by ultrasound. Invest Ophthalmol. 1964;3:657–664. Jump up ↑ Pastor SA, Singh K, Lee DA, et al. Cyclophotocoagulation: a report by the American Academy of Ophthalmology. Ophthalmol- ogy. 2001;108(11):2130–2138. Jump up ↑ Lin SC, Chen MJ, Lin MS, Howes E, Stamper RL. Vascular effects of ciliary tissue from endoscopic versus trans-scleral cyclophotocoagulation. Br J Opthalmol. 2006;90:496–500. 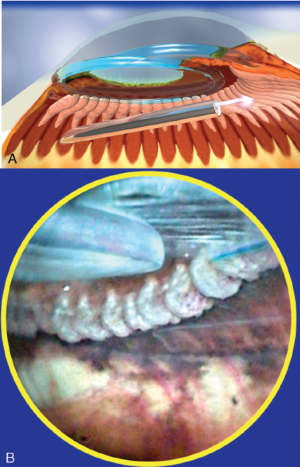 Jump up ↑ Uram M. Ophthalmic laser microendoscope ciliary process ablation in the management of neovascular glaucoma. Ophthalmology. 1992;99(12):1823–1828. Jump up ↑ Yu JY, Kahook MY, Lathrop KL, Noecker RJ. The effect of probe placement and type of viscoelastic material on ECP laser energy transmission. Ophthalmic Surgery, Lasers & Imaging. March/April 2008. Vol. 39. No.2. ↑ Jump up to: 13.0 13.1 Kahook MY, Lathrop KL, Noecker RJ. One-site versus two-site endoscopic cyclophotocoagulation. J Glaucoma. 2007;16: 527–530. Jump up ↑ Lin S. Perspective: endoscopic cyclophotocoagulation. Br J Ophthalmol. 2002;86:1434–1438. Jump up ↑ Wilensky JT, Kammer J. Long-term visual outcome of transscleral laser cyclotherapy in eyes with ambulatory vision. Ophthalmology. 2004;111:1389–1392. Jump up ↑ Uram M. Combined phacoemulsification, endoscopic ciliary process photocoagulation, and intraocular lens implantation in glaucoma management. Ophthalmic Surg. 1995;26(4): 346–352. Jump up ↑ Berke SJ, Cohen AJ, Sturm RT, et al. Endoscopic cyclophotocoagulation (ECP) and phacoemulsification in the treatment of medically controlled primary open-angle glaucoma. J Glaucoma. 2000;9(1):2000. Jump up ↑ Netland PA, Mansberger SL, Lin S. Uncontrolled intraocular pressure after endoscopic cyclophotocoagulation. J Glaucoma. 2007;16:165–167. Jump up ↑ Siegel MJ, Faridi O, et al. The Long-term Efficacy Of Combined Endoscopic Cyclophotocoagulation (ECP) And Phacoemulsification In The Treatment Of Mild-moderate Glaucoma. Poster Presentation/American Glaucoma Society Meeting. 3/2012. Jump up ↑ Ahmad S, Wallace DJ, Herndon LW. Phthisis after ECP. Ophthalmic Surgery, Lasers & Imaging. September/October 2008. Vol. 39. No 5. Jump up ↑ Bechrakis NE, Muller-Stolzenurg NW, Helbig H, et al. Sympathetic ophthalmia following laser cyclophotocoagulation. Arch Ophthalmol. 1994;112:80–84. Jump up ↑ Noecker RJ. Paper presented at: The ASCRS Symposium on Cataract, IOL and Refractive Surgery. San Diego CA; May 1, 2007. Complications of endoscopic cyclophotocoagulation: ECP Collaborative Study Group. Jump up ↑ Chen J, Cohn RA, Lin SC, Cortes AE, Alvarado JA. Endoscopic photocoagulation of the ciliary body for treatment of refractory glaucomas. Am J Ophthalmol 1997;124:787-796. Jump up ↑ Lima FE et al. A Prospective, Comparative Study between Endoscopic Cyclophotocoagulation and the Ahmed Drainage Implant in Refractory Glaucoma. J Glaucoma 2004;13:233-237. Jump up ↑ Gayton JL, VanDer Karr M, Sanders V. Combined cataract and glaucoma surgery: trabeculectomy versus endoscopic laser cycloablation. J Cataract Refract Surg. 2000;26:330–336. Jump up ↑ Tan, JC, Vakili, G, Noecker R, Francis, B. “ECP-Plus” to Treat Refractory Glaucoma. Poster 21st Annual AGS meeting.